April 20, 2016, 9:57 a.m. The students traveled to Houston over spring break to shoot footage to accompany a ProPublica/Texas Tribune project on what a hurricane could do to the city. By Kaitlyn Mullin April 20, 2016, 9:57 a.m.
How can you get someone to care before a disaster strikes? Could virtual reality help? That’s what we’re trying to find out. The Jovrnalism team, a collection of students based at USC Annenberg producing VR journalism experiences since last year, is working in partnership with ProPublica and The Texas Tribune to create a virtual reality experience for the story Hell and High Water, about the risks of major storms along the Houston shipping channel. We realized early on that to do this right, we had to do on-the-ground production. So we spent spring break in Houston together. Our goal was to see if a group of students with different levels of VR experience could pull off a full-scale, on-location 360º video shoot in three days. Spoiler alert: We did, but not without a few hitches. We had a lot of gear for this trip, thanks to partnerships with Google News Lab and Radiant Images, which is an incredible digital cinema innovator and rental house. And we ended up using almost all of it. We had a couple custom 7-GoPro camera rigs and a 6-camera rig with wide-angle lenses from Radiant Images. Those work with external batteries, eliminating some of the biggest headaches in 360 production. We also had accessories like chargers, backup batteries and cameras, monopods galore, and a cool gyro setup meant to overcome uneven shooting conditions. 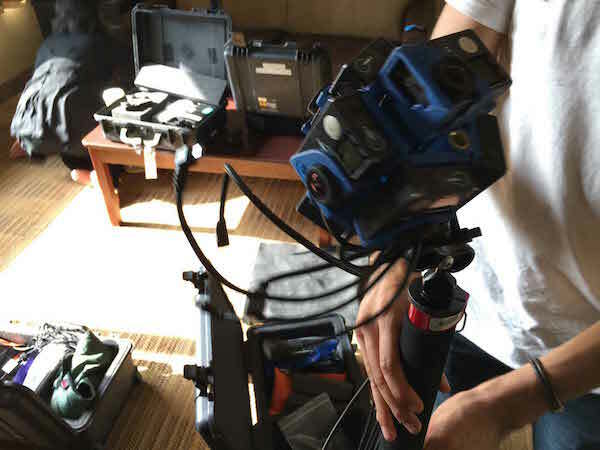 From Google, we had a 6-camera 360Heros rig, a 2-camera rig fitted with iZugar lenses and a couple more monopods. We also brought our own 6-camera Freedom 360 rig and a RICOH Theta camera for still images. Thanks to Lenovo we brought a new, high-powered ThinkPad P70 laptop for stitching (in additional to all our own laptops), a multitude of external hard drives (we ended up with about 1 terabyte of footage all said and done), backup SD cards, a DSLR and audio recording equipment. It came in handy to have so many rigs and backups, especially since we only had a few days and were working in teams — but repacking everything was especially challenging. For all of our shoots, we had the GoPro Hero 4 cameras in video mode and set to 1440-60 (resolution, frames per second), PT (protune on), ISO400 WB native. We also made sure to keep our shot counts lined up (e.g. all 7 cameras in the rig would be on 00 when we started, and if we accidentally started recording on a camera, we would create a matching track on the other 5) to make backing up and editing the footage easier later. We stitched and toned the videos in Kolor Autopano Video and Giga and our output settings are 4096×2048, PRESET H.264 4K, FPS original video. Rendering takes a long time, so if you have a lot to stitch and edit, we suggest batch rendering overnight. A few of us had a little experience working with 360º video rigs and our academic specialties ranged from PR to game design, so we each brought something different to the team. Despite all the preplanning before, this trip was an on-the-ground, live production experiment for us. I cannot accurately express how useful these were. I could wax poetic about those batteries. It was a pretty easy setup from Radiant Images, simply attaching a big external battery to the monopod and running 7 micro USBs up to the cameras (using cord ties to secure them out of the shot). Anyone who has shot in 360 before and suffered through the painstaking process of swapping out camera batteries from 6-7 GoPros all tightly buckled in to a rig designed to keep them in place can appreciate this surprisingly simple solution. With the batteries, we were able to shoot for hours, limited only by SD card space. Lest you return home only to discover while stitching that you have a lone USB sticking out into every single one of your shots. That is seriously going to be a pain to work around. We had a few run-ins with local authorities and security officers during our trip, but thankfully avoided any real trouble by *gasp* not actually doing anything wrong. We found most of the people we spoke with to be friendly and understanding when we explained who we were and what we were doing. We did get shouted at once, but if you know what is public property and what is within your rights as a journalist before you go, even the most easily irritated of locals won’t be able to keep you from getting what you need. While we went to Texas with a pretty solid plan and a good idea of what shots we were looking for and what we could realistically pull off in 3 days, we stayed flexible, and that really paid off for us. One local source managed to get us last-minute access we hadn’t seriously considered an option. Dividing into teams allowed us to shoot continuously and in multiple locations, and a couple of our most dynamic and interesting shots were the result of sheer luck and being in the right place at the right time. Especially when it is windy and/or on uneven terrain. Eager to get out and shoot our first day, we grabbed some gear and headed out to one of the locations we had scoped beforehand only to discover that our rig only fit on the one monopod we had brought that did not have legs. Ever the MacGyvering crew, we used duct tape to secure the legless monopod to another one we had brought, and even used duct tape to secure the whole thing to the ground but to no avail. After successfully filming one take, our rig fell over (twice!) at our second location and suffered some damage. We lost a good GoPro that day. Rest in piece(s), Camera 5. We had an awesome gyro monopod and rig from Radiant Images and, serendipitously, we had a boat ride through the Houston Ship Channel scheduled to test it out on. As we excitedly unloaded the gear at the launch point, we realized we had forgotten the battery that powers the gyro. Luckily, the gyro rig was heavy enough on its own to counteract the boat’s movement, but it wasn’t until on the boat that we realized our Camera 5 was really dead. That said, between our own monopod with wide legs and our intrepid cameraman Kevin’s impressive filming stance, the boat footage actually turned out pretty stable. But seriously, rookie move: Check your equipment before you arrive on location. Actually, before you leave your base. In conventional journalism, clever framing is usually enough to ensure the reporters are out of the shot, but with 360º video this becomes much more difficult to pull off. While there is a debate about approaches to removing journalists from the footage, most of the time, we just set up the cameras and then ran away, either getting in a car and driving away or hiding behind any sort of large structure in the shot. However, this made some locals (understandably) very nervous as we set up a big dark rig and then ran away from it as quickly as we could. One local who was questioning what we were doing became visibly agitated when we started jogging towards the camera. Another curious bystander filmed us for about five straight minutes. Maybe she was just interested in what we were doing, but it was probably because one of our group members kept accidentally leaning on/tapping the wrong car. One local filmed us from her house after she asked if we were Google Earth (we said no). Try your best to avoid looking suspicious altogether. Double-check all of your cameras are on and filming every time. We had two or three sets of eyes checking on every take, and that helped catch some mistakes before they happened. Back up all of your footage on more than one hard drive, and make sure you do it right. (Professor Robert Hernandez missed transferring a few files to our master hard drive.) Do some stitching as soon as possible to make sure your footage is turning out how you want, especially if you are only on location for only a few days. Basically, expect to encounter problems and be prepared. We had one team member down for the count for two days after he contracted pinkeye, and the rest of the team nervously anticipated illness and suffering psychosomatic itchy eyes. If you’re prepared for disaster, you’ll be pleasantly surprised when everything comes together in the end. We almost missed our flight to Houston. Seriously. There was a lot of sprinting involved and we were literally the last (and sweatiest) people to board that plane. Then, when we arrived in Houston, we discovered that two of our team members had driven their rental car to the wrong airport. It all worked out in the end, but we had a bit of a rough start to our trip that definitely could have been avoided. Ultimately, we had an incredibly successful trip to Houston. 360º video was shot, mistakes were made, barbecue was eaten, and fun was had. At least we have something to laugh about while we are toiling our way through post-production. Kaitlyn Mullin is a blogger/vlogger and emerging technology enthusiast studying digital journalism at the University of Southern California. POSTED April 20, 2016, 9:57 a.m.
Mullin, Kaitlyn. "What a group of USC students learned shooting lots of VR video (hint: duct tape is involved)." Nieman Journalism Lab. Nieman Foundation for Journalism at Harvard, 20 Apr. 2016. Web. 18 Apr. 2019. Mullin, Kaitlyn. 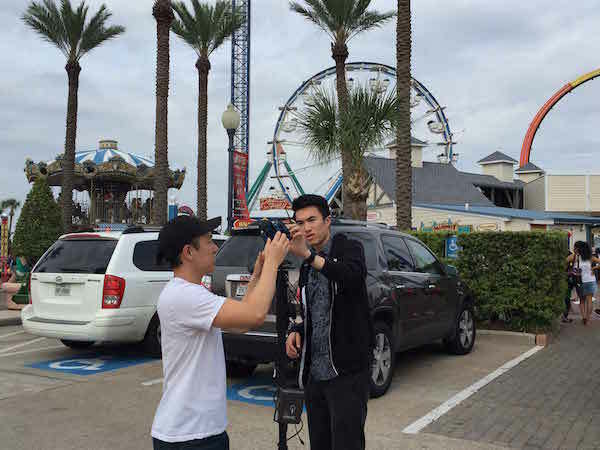 "What a group of USC students learned shooting lots of VR video (hint: duct tape is involved)." Nieman Journalism Lab. Last modified April 20, 2016. Accessed April 18, 2019. https://www.niemanlab.org/2016/04/what-a-group-of-usc-students-learned-shooting-lots-of-vr-video-hint-duct-tape-is-involved/.